Launch parameters are close to nominal. 22.20 UTC: Telemetry transmission is going on. On November 16, 1996 at 20 hours 48 min 53 sec UTC Launch Team of the Russian Space Forces has launched MARS-96 spacecraft from Baikonur cosmodrome. 20.43: 5 minutes readiness has been declared. 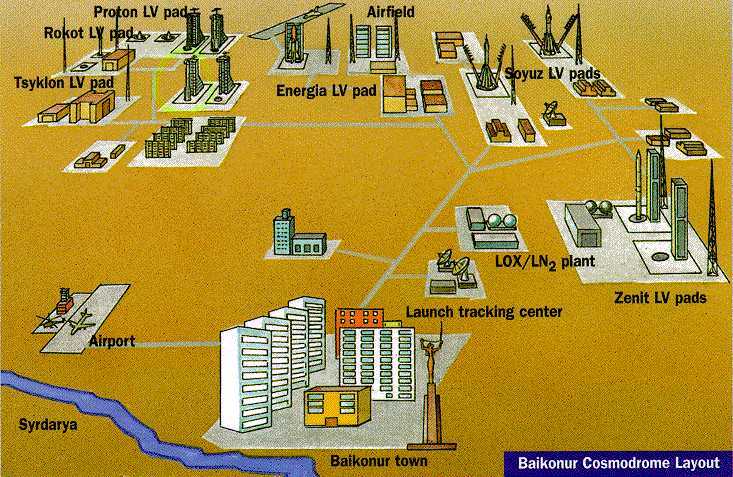 20.20 UTC: Launch vehicle control system has been prepared to launch. Additional fueling of launch vehicle. 20.05 UTC: Measuring complex tests launch vehicle and spacecraft systems. 19.55 UTC: Onboard systems have been connected to onboard power supply. 19.39 UTC: Service tower is leading off. 19.35 UTC: Launch team evacuation. 17.35 UTC: Second stage of fueling of launch vehicle has been completed. Technological time break until 19.10 UTC. 16.10 UTC: Fueling of booster has been completed. 16.00 UTC: First stage of fueling of launch vehicle has been completed. 12.50 UTC: Board of technical directors of the Project have finally decided that MARS-96 spacecraft will be launched on November 16 at 23 hours 48 minutes 53 seconds MSK (20:48 53 UTC). 11:00 UTC: Preparation for fueling of of launch vehicle and booster began. Technological procedures in terms of MARS-96 spacecraft launch preparation are performed since 04.30 until 17.00 UTC. Service tower has been led up to launch vehicle at 09.00 UTC. Technological procedures in terms of autonomous and integrated checking of systems of spacecraft, launch vehicle and launch complex have been started.